Welcome to deep dark Africa! Housekeeping… cleaning, washing, maintenance; you would think these are just your average daily housekeeping duties, but not in the heart of the Zululand bush. Every morning begins bright and early with all the birds chirping in delight. Watching the weavers build their nests and the mating pair of Paradise Fly Catchers flying around the lodge is so beautiful. It’s always quite eventful to walk around doing room checks and look and listen. You come across the most amazing creatures; from a Natal Hinge-Back Tortoise to the strangest looking centipedes and GIGANTIC snails! Watching the Nyala come so close to the rooms you could literally touch them and warthogs with their cute piglets playing and wallowing in the mud. In the late afternoon and evenings is where most of the activity happens. The housekeeping ladies always come calling me for something and I will grab 2 things – snake tongs and an air horn! You never know what to expect when you get there. One afternoon after tea, Thembi called Victoria (reception) and I in to the lounge. 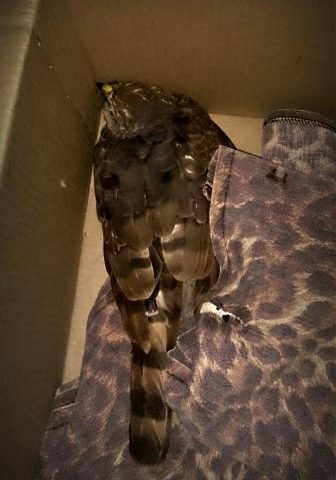 An African Goshawk had flown into the window and was down on the floor. I remember feeling so sad, it was such a beautiful bird I had to try help it. I wrapped a towel around the bird so it wouldn’t claw or bite me and put him in to a box to calm him. I placed him in the office where it was quiet and checked on him every now and again. We loved him so much already we named him Tony. I took him back to the digs compound with me that evening where he stayed for the night as the bird still did not look good. The next morning I called Ivor, one of our managers, to come check on Tony. He had no broken bones and was moving more than the previous afternoon , a little encouragement and off he went back to where he belonged! Another evening, Thembi came calling yet again from the private dining area. I ran there thinking the worst and arrived to another two ladies, Thola and Bongi, with their brooms trying to remove something from the corner. It was a baby Water Monitor Lizard! The ladies just couldn’t understand why I was trying to catch it and how I could think it was so cute. Sometimes we have to chase baboons away from the lodge. All of us run around beating pots and pans and blowing air horns. Once all is quiet again I love sneaking up on the ladies and giving them a fright blowing the air horn. The madness starts and all of us try to get back at one another – hiding around corners in the dark to see who we can scare. Just the other night I had the ladies come calling saying that there was a snake in the laundry room! Zulu people are superstitious of snakes and will avoid them at all costs. As usual, I grabbed the tongs and ran to help them. We were all standing outside looking in the dark for a snake which we found curled up between the mops. The ladies screamed when I tried to catch it, not making my task any easier. Just too much craziness with my crazy ladies if you can only imagine as Zulu woman are; very boisterous and gestural. After much commotion and hustling I had it in a box – it was an Eggeater snake. I showed it to the ladies and explained to them it was harmless and a special snake. After show and tell we let it go.